Hey Metalheads! Jason here. How is it 2019 already?! 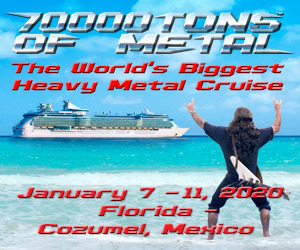 I can’t believe that a year has gone, and that we are about to embark on another adventure aboard the Independence of the Seas for 70000 Tons of Metal! Honestly, this event is like no other I have ever experienced. The event itself is extremely well-run. The staff from Royal Caribbean and 70000 Tons are fantastic. With the extremely tight timelines for build and tear-down, the effort that the stagehands put forth is nothing short of herculean. From a people perspective, this is like being at one gigantic family reunion, but everyone gets along. One thing that stood out to me was the chance that other metalheads had to “visit” other countries. I don’t mean just the US or the cruise destination (last year, Turks and Caicos Islands – this year, Labadee, Haiti). I’m talking about money. Coins from all sorts of different countries are traded by many of the attendees. I’ve done a little bit of traveling in my life and enjoy seeing currency from different countries, so I understand the appeal of trading coins. Survivor tip: For those of us in the US, our quarters are a big deal. Many people are trying to collect the whole set. Bring a pocket full and share them with others! As of this writing, there are 9 bands left and 14 days until we sail! Like last year, there are many bands I’m looking forward to seeing, and some new bands I’m looking forward to checking out. Bloodbath – I have been a fan for a long time, however I have never seen them live. I wish I could have seen them with Mikael, but I’m very happy to see them with Old Nick! These guys will be a dual set show for me. Nile – Ever since I saw them on tour with Cannibal Corpse, Krisiun and The Crown (hey 70000 Tons – get these guys on 2020!) I have been a huge fan. I love everything ancient Egyptian, so Nile speaks to me. Not to mention that I’d love to have a beer and talk about Egypt with Karl Sanders. Another dual set band here. The Black Dahlia Murder – Another long-time band for me. Love the music and the guys are super cool. Again, a dual set band for me. Obituary – How can you not want to see one of the old school Florida death metal bands at least once in your life? That’s right. Have not seen them live yet, and it’s time to change that. Fleshgod Apocalypse – I saw this band for the first time in June 2018. Definitely looking to make that three times after this cruise! Cyhra – Two words: Jesper Strömblad. He’s written some of my favorite riffs of all time. Looking forward to seeing him live again! Krisiun – Straight up Brazilian death metal. I’m hoping for a pool deck set during the day! Soulfly / Max & Iggor Cavalera Return to Roots – I caught Sepultura on their Chaos A.D. tour, but missed them on Roots. I’m happy that I’ll be able to see Max & Iggor play the album in full! Again, hoping for a pool deck set for this one! Ne Obliviscaris – I have heard a lot of good things about this band. The music I have heard so far is pretty damn good. I’ll be checking them out for sure. Kalmah – Looking forward to seeing these guys live for the first time! Dark Funeral – Old school Swedish black metal! Need to see them! God Dethroned – I’ve known of these guys for a long time but have never seen them live. I’d like to change that. Paradise Lost – I’ll probably lose points for saying this, but I have never seen Paradise Lost live either. Some may think I live under a rock at times. Pestilence – Since their 2018 US mini-tour was cancelled, I haven’t seen them live yet. That’s going to change! Sodom – Old school German thrash metal! Got to see them! Vomitory – More old school Swedish death metal! So far, this lineup is looking great! I’m really hoping for some more amazing announcements coughGOJIRAcough. 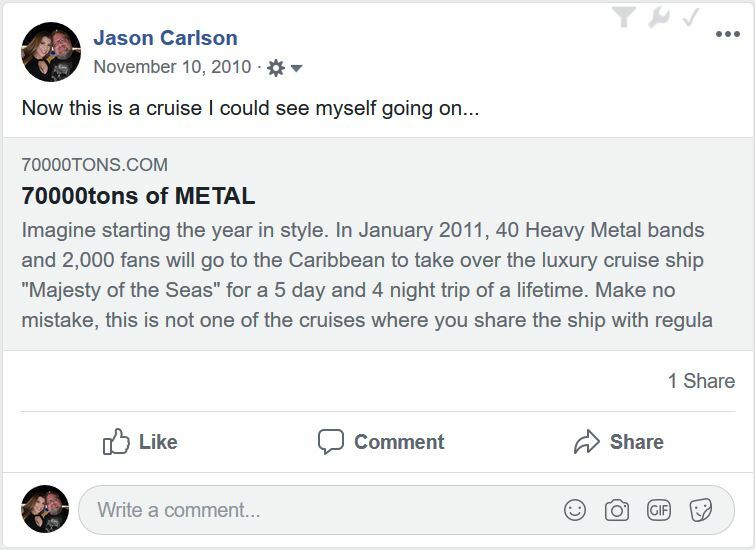 Last year, they announced a surprise 61st band (Exodus) right before the cruise. I’m hoping they announce another surprise this year. How amazing would it be for Slayer to make 70000 Tons of Metal a stop on their Final World Tour? Last year, I came back with 3,928 photos using 265GB of space. With the lineup this year, I think I might beat that. Stay tuned for our photo coverage and interviews!